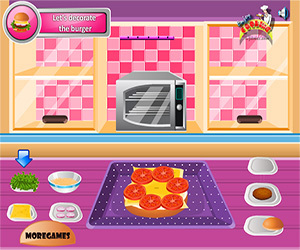 Yummy Hamburger Cooking is a great cooking game from which you'll learn how to prepare a great hamburger in your kitchen like the one of your preferred fast food! You have to take the right ingredients from the cupboard: salad, sandwich, eggs, chicken, salt, pepper, cheddar, tomatoes and onions. Then you've to mix them: add eggs, chicken, salt and pepper into a bowl and use the wooden spun to mix! Place the patties and dip them in a bowl of bread crumbs. 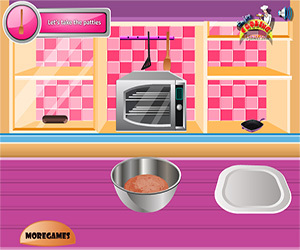 After all this you have to cook the patties in the pan on the stove and switch the oven on to cook the bun! In the end you've to decorate the burger: cheddar, tomatoes, salad, patties and the onions! DONE! You can now eat your tasty hamburger! And if you're a gourmand you've to add french fries into your plate! Isn't this a really fun game? Play it now!